Rocket J. Squirrel and Bullwinkle J. Moose have remained among the most beloved television personalities for generations. Many of those raised on Rocky and Bullwinkle are now C-level, P-level, VP-level, D-level, M-level, and even E-level (entrepreneurial) business leaders. The irreverent and iconoclastic attitude Jay Ward and Bill Scott wove into their cartoon characters and storylines has never been matched for its unique combination of sophistication and absurdity. Ironically, there is a lot of sophistication and absurdity in organizations of all sizes; oftentimes less of the former and more of the latter. Although, we can’t blame the wackiness of the modern workplace on a moose and a squirrel, any topic this cast takes on is entertaining because they’ll do everything wrong that can be done wrong, and good will still triumph over evil—in spite of itself. Oh that it were so in the real world of office politics. 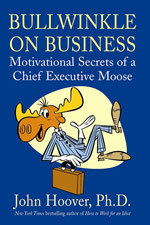 The core and charm of Bullwinkle's character, the essence of what made millions of fans across several generations love him, is the contradiction between an inexhaustible belief in his own ability to accomplish great things and his unblemished record of goofing up everything he ever attempted. “Hey, Rocky,” bragged the self-proclaimed magician moose, “watch me pull a rabbit out of my hat.” The only thing Bullwinkle never pulled out of his hat was a rabbit. How like the archetypal business tycoon of today. In this business adventure, Rocky remains Bullwinkle’s better angel and constantly reminds the top moose how business really should be conducted. Just as Rocky is the voice of reason, Boris Badenov and his femme fatale, Natasha, are the voices of un-reason. They are, as they always were, foils to Rocky and Bullwinkle. Despite their insidious and nefarious agenda, their schemes are as inept, inadequate, improbable, and implausible as the well-intentioned but maladroit moose’s.